Extensible 3D (X3D) Graphics and Humanoid Animation (H-Anim) Standards provide a coordinated set of steadily evolving ISO standards which are Royalty Free (RF) and publicly available for any use. 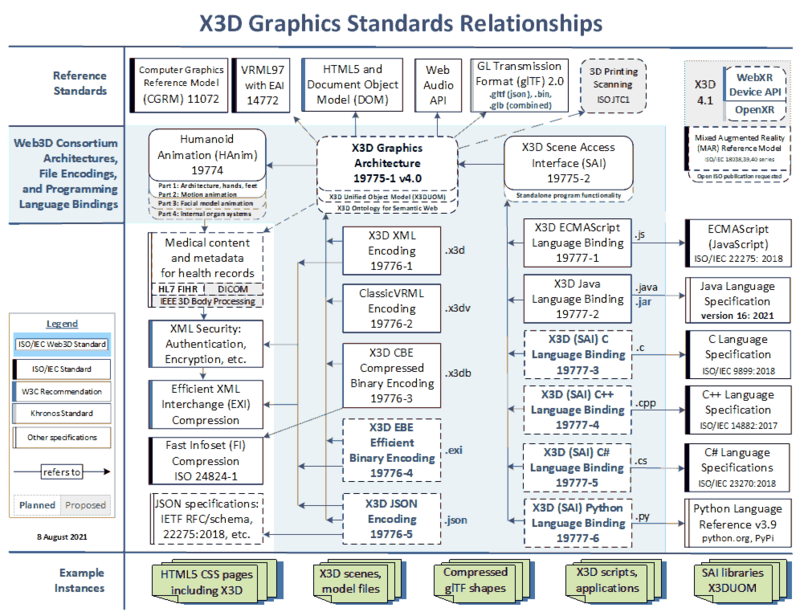 X3D is an ISO ratified, royalty-free open standards file format and run-time architecture to represent and communicate 3D scenes and objects. X3D graphics provides a system for the storage, retrieval and playback of real time graphics content embedded in applications, all within an open architecture to support a wide array of domains and user scenarios. The Web3D Consortium Standards Strategy carefully improves and evolves our standards while maintaining long-term archival stability. 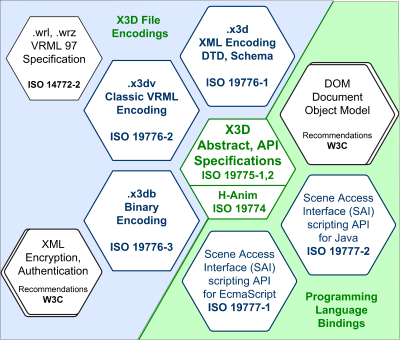 These standards have been continuously developed, tested, maintained and updated by Web3D Consortium members for many years, starting with Virtual Reality Modeling Language (VRML) in 1997. Following public comment and subsequent approval by the Web3D Consortium, all changes are submitted to International Standards Organization (ISO) as part of a series of annual reviews by national bodies around the world. The X3D Working Group proceeds collaboratively at the best speed possible for achieving rigorous quality and stable evolution. Progress is supported by member and public contributions. We welcome comments concerning any issue you might find in any specification. Each issue is promptly handled by the X3D Working Group with both email and teleconference review, and progress is tracked until each issue is resolved. Comments, bugs, or inconsistencies can be submitted on the Standards Comment Form where you have an opportunity to fully describe the issue. General comments or questions can be submitted on our Contact page. Thanks for your interest and all feedback.